Try Continuous Ink System with your Brother MFC-295CN and make 30 times more quality prints for the same money! Pay only 0.04 USD for A-4 full color print! Ink System for Brother mfc-295cn: How much is it profitable? In what cases is such system profitable? It is better to apply continuous ink supply system CISS brother mfc-295cn in ink-jet printers with embedded printing head (there are printers without printing head inside of them вЂ“ it is located on a cartridge). It results first of all from high resource of a printing head. Continuous ink supply systems can be used in all ink-jet Brother printers and allow saving sufficient money on print more than 50 times comparing with the use of original cartridges and 30 times in contrast to the use of non-original cartridges. Using such ink system for brother mfc-295cn at home you can achieve sufficient economy of money and time on print of photos and any colour production. Continuous ink supply in the office provides great economy even while printing common documents. The cost of print with the use of CISS is now lower than the cost of print on laser printer. CISS mfc-295cn for business is a new opportunity for rendering new services. Color copying, immediate print from digital media, photo print, print of posters and other advertisement materials вЂ“ everything becomes unusually economic with the use of continuous ink supply system. CIS brother mfc-295cn, however, like its neighbor-models such as CISS for brother mfc-j410w and CISS for brother mfc-j615w represents a device consisting of ink containers connected with the help of a channel silicone loop with cartridges identical to original ones. 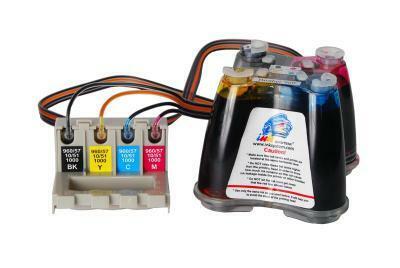 Such ink supply systems as CISS ink system brother mfc-295cn perfectly fit for the use both at home and in the office. By using them the cost on print includes only expenses on ink and not on expensive original cartridges which results in sufficient economy of financial and time expenses on colour ink-jet print. The volume of external containers (each of 80 ml) is on average 8 times larger than a size of in-service cartridge. Considering the fact that 1-1,5 ml of ink is consumed for the print of one A4 format photo, the system allows printing of one hundred photos non-stop and user just rarely needs to add ink into containers which you can successfully do even while printing. Using of continuous ink supply system CISS for mfc-295cn allows sufficient increasing productivity and reducing exploitation expenses, reducing prime cost of print many times and increasing general quality of works.